Wilmar International Limited operates as an agribusiness company in the People’s Republic of China and internationally. The company operates through four segments: Tropical Oils, Oilseeds and Grains, Sugar, and Others. It engages in the oil palm cultivation, harvesting, and milling activities that primarily provide crude palm oil and palm kernel; and milling of fresh palm fruit bunches. As of December 31, 2016, the company owned an oil palm plantation covering an area of 241,892 hectares in Indonesia, East Malaysia, and Africa. It is also involved in the processing, merchandising, branding, and distribution of palm oil and laurics related products, including oleochemicals and biodiesel; and oilseeds products, such as soybean, rapeseed, sunflower seed, cottonseed, canola, peanut, corn, and rice bran oil and meal products, as well as rice, flour, wheat bran meal, and bran and pollard to distributors, wholesalers, feed millers, industrial users, and retailers. In addition, the company produces and markets edible oil, rice, flour, grains, and noodles to traditional retail outlets, supermarkets, convenience stores, and hypermarts under its own brands. Further, it engages in the milling, refining, merchandising, branding, and distribution of white sugar, brown sugar, caster sugar, and syrups in bulk and packaged forms; generation and sale of electricity; manufacture and sale of bioethanol, as well as nitrogen, phosphorus, and potassium compound fertilizers; distribution of a range of chemicals and specialty ingredients; and ship-owning, chartering, brokering, and management activities. The company was founded in 1991 and is headquartered in Singapore. benson911 I thought enter at ard 3.40 is low alr, who knw price getting lower n lower,so hard to predict stock indeed. 333a110 If result out tonite is abt same like noble = more upside potential; otherwise, sry lah. moven00 Haiyah, mana Eh Kee Siao....open fire burn the house nia la. Tomolo got some people's wealth going to burn up in ashes. benson911 Hi Scimitar, wat price u think can enter, 2.5? Thx a lot. No rush, its time we slowly follow wilmar movement. *Remember Good stock will one day recover. 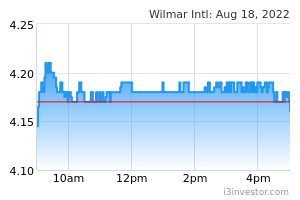 If we are long term investor, emmmm....why not buy and keep Wilmar? *Try not to lose your money in investment. That is important. mujihero share buy back!!! It is deep in value now!!! moven00 Ole Ole Ole...... Sold all my Wilmar 3.48 today. Yeahhhhh!!! DaveSingh too bad Moven00 you sold wilmar.. its up again so much today.. and its going up much much more.. you remember you call me bodoh singh.. who is bodoh now @moven00.. i am laughing at you!!!! 1728926026 I think Wilmar will be profitable if keep for 3 to 5 years. Anticipate double fold gain from Wilmar. passerby double fold within the duration of 3-5years ? 1728926026 Just my anticipation, palm oil sector has been in harsh time for some time, it's good to hold it now and wait for range bound for palm oil price. But only patience will pay. 1728926026 Nice to meet you too. No, I never post anything, just give some comments and opinions here. Ya quite a lot Msians using i3 for discussion, but I think most of them are short term trader rather than value investor. Alex Gray Hello to all!!! Get intra-day and positional stock tips as well as forex and commodity tips at http://goo.gl/GCG76y.. Take a 7 days free trial and watch the result of our recommendation. KiasiPu 3.07, should buy or run?? Diamond7 Quarterly report....profit up 49% !!! Diamond7 2015....why no dividend yet? Diamond7 Dividend 0.055 on 18 th May 2016!!! LeeJacky Wilmar still strong...on boat. Diamond7 wa! S3.80....still very strong! Any bonus? Diamond7 wa....and wah...hhh. Touch S4.00 already! !